The Clear Genius cartridge filter pod. The Clear Genius incorporates a two-piece reusable cartridge and Filter Pod™ refills, which are made from recyclable casing material – high-grade coconut shell carbon and ion exchange resin. The company says that certification is pending from the Water Quality Association, and the system reduces water contaminants including chlorine and heavy metals such as mercury and cadmium. The cartridges are designed to fit many brands of water filtration pitchers, such as Brita® and PUR® as well as its own branded pitcher. Each Filter Pod refill removes impurities from 40 gallons of water (or two months of total use, whichever comes first) before needing to be replaced. 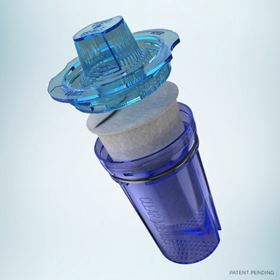 This is claimed to be equivalent to Brita® and PUR® disposable filters, however, because of the reusable cartridge, the Clear Genius system can offer a cost saving to the consumer. Crossflow membrane technology works as a physical barrier against microplastics. Filtration Group Corp has agreed to buy Essentra plc’s Porous Technologies operations.